Once he realized where she was headed he released the mouse from his control. It jumped from her shoulder and scurried away. Back in his human form he quickly stood up and composed himself, walking back to the main room of his hut. He wondered why she would be coming to see him. Oh! She was startled that the mouse jumped off her shoulder. She paused for a moment, wondering what she had done to make him run away, not knowing that Asher had recalled himself back into his human form. She dropped the basket at the door of Asher’s hut and peeked in hesitantly. He didn't move from his position at the back of the room, "Yes, I am here." He fiddled with herbs on a table, seeing her face, "Come in, if you like." He scratched the back of his head, "I am sorry if my presence was unwanted.. you seemed upset before and I wanted to see what was troubling you." She decided to step inside. Her eyes looked around at the hut. She assumed that many of the herbs and totems he had were shamanistic in nature, but she didn’t know a thing about them. Her father didn’t seem to take much stock in religion, but it hadn’t always been that way. The elders of the Broken Fang still worshipped in the old ways, but the younger generation did not. Amber wondered why that was. To tell the truth, she felt a little sorry for Asher. He was overlooked by many as a simple mystic. But she did think it was amazing what she had seen today. She didn’t have many meetings with the shaman in the past and had no idea that magic could really work. He nodded, "I felt your soul was troubled, you are unhappy with your place in life." He smiled to her, "I suppose I should have known simply from our conversation." He looked away a moment, "You have never been here before.. I did not think you cared for the thoughts of the spirits." He smiled at her request, it was the first time someone had been interested in months, "Certainly.. if that is your wish, I do not know as much as an elder but I have been taught much.." He rubbed his chin, "Though.. I doubt your father will like the idea." He remembered when he had found her, wielding a spear, ready to kill, "Are you sure the path of war is not more suited to you..?" "Well if he respects me he shows it in odd ways, running his errands has nothing to do with my gifts." He stepped around toward her as she spoke, "No, it is the right choice, one many do not realize." He looked past her at the door, "I will gladly teach you if you are willing to learn, we can begin now.. if there is nothing else you must do." He nodded, saying nothing further. He led her outside and through the village out to a large field just outside the village. He walked up to a small rock and tapped it with his staff, "Sit." Once she sat he sat cross-legged on the ground in front of her, "One of the first things you must learn is how to focus on the earth.. and fade out the noise of human interaction.." He looked up to her, "This is no easy task, it will take you some time to master it." Their proximity to the village let them still be able to hear some of the noise of business inside but they could still hear sounds of nature coming from over the hills and the sound of the wind shaking the grass. "Reach inside yourself, find your calm.. you must forget your mortal worries or they will drown out everything else; and then.. close your eyes and listen." 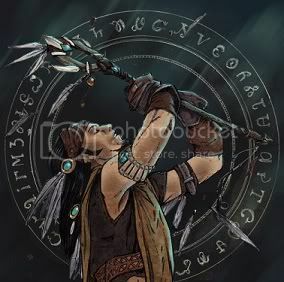 He closed his eyes and rested his hands on his knees, "You will begin to hear the voices of the spirits.. quietly at first, it takes time to understand them." She followed him out of the hut, curious as where he was leading her. The two of them together got some strange looks, and then the women bent their heads towards one another and started a new string of gossip. Amber sat down on the rock as she was instructed to do so. She alertly listened to his every word, her eyes wide with the sudden seriousness of the situation. She closed her eyes and breathed deeply, trying to shut out the sounds of the village and listen to the voice of the wild. The wild she embraced but she wasn’t used to forgetting her worries. Her eyelids trembled with the effort. He opened his eyes slightly, noting her efforts, "You are in control of your destiny Amber, only you can make the decisions that direct your path, remember that. The spirits guide us all.. if you can release your thoughts, you will see." It was customary to help those who could not make the first jump to see, and non-born shamans rarely did. Keeping his eyes closed he raised his hands, placing them on her knees, their skin touching. She would feel an overwhelming sense of calm wash through her, aiding her in her efforts. Asher’s words conflicted with what she had been taught. She was consistently reminded of her place by her own mother and father. But her heart soared at his words too. Perhaps things would work out for her if she kept believing that they would. Amber opened her eyes a little as he pressed his palms against her skin. She closed them again as the calm washed over her and her body relaxed. She let out a soft sigh, trying again to do what Asher asked of her. To let go and listen to the spirits. The wind stirred her hair among her shoulders and with that wind came the fragrant scents of the field. She turned her face towards the wind as if trying to listen to what it was saying. The wind carried with it a soft sound like chimes, it was its natural music, and with it the quiet voices of everything it had touched. To the untrained ear the spirits simply sounded like a cacophony of tones of hundreds of variations threatening to overpower the aural senses. It was a careful art to discern them, nature never slowed down, it was a constant working machine with billions of parts. His fingers clenched her knees a little tighter as he struggled to maintain both their visions and suppress her emotions.